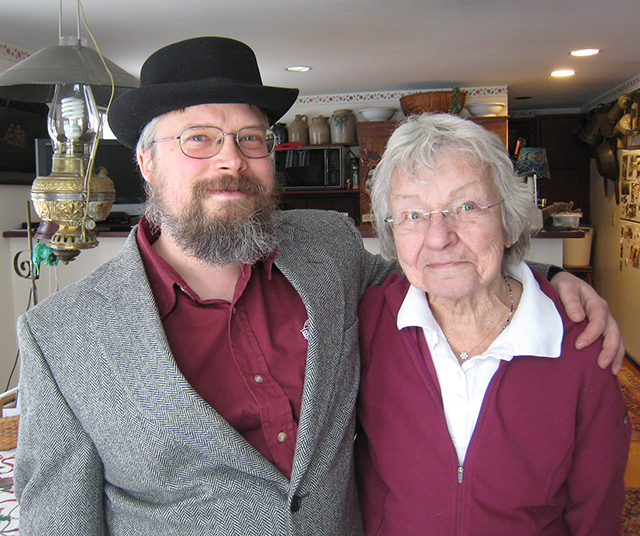 A file photo of Jesse Schust and Pat Cutter taken when Pat handed the presidency of the Andover Historical Society over to Schust. Pat was nominated for this award with unanimous and enthusiastic agreement of the Officers and Board of the Andover Historical Society, and supporting materials were received from former Presidents of the Society as well as Board members of the Wilmot Historical Society. Volunteers and members of the AHS are delighted that Pat is being recognised at the State level for her extraordinary work. Pat Cutter has worked with the Andover Historical Society (AHS) for many years. She joined the governing board in 1993 as Vice President – working alongside most of the founders of the organization. She later served in a variety of other roles – Museum Director, Collections Curator, and Annual Fair Coordinator. She served as President for twelve years, from 1996-1998 and 2006-2016. She has made many major contributions to the work of the AHS as well as to neighboring historical societies. Most officers and volunteers in the AHS were recruited and trained by Pat. She has brought continuity and vision to the AHS for more than 25 years. Her depth of knowledge and experience has been instrumental in creating the AHS as it currently is. Pat has organized the annual Old Time Fair for nearly two decades, turning it into a major event which educates and entertains while raising the bulk of the AHS funds every year. Pat oversaw the acquisition of the Railroad Freight Shed and then coordinated the installation of a historical freight car at the Potter Place Rail Depot museum. She produced the annual AHS Calendar, which gives the community access to our photographic holdings and helps to raise funds. Pat brought the AHS into the computer age by acquiring the first computer for the organization, and overseeing the digitization of the AHS collections database. She ensured that the oral histories held by the organization as audio cassettes were conserved into digital audio files as well as initiating a project to transcribe them, and personally transcribing a large number of them. She oversaw the transcription of Helen Phelps’ diaries which have been made available to the public during the past year. Pat also played a major role in helping the neighboring Wilmot Historical Society to digitize aspects of their collection in a similar manner. In her role as a Cemetery Commissioner, Pat has created a centralized catalogue of the gravestones and cemeteries in Andover (some of which date back to the middle of the 18th century). Pat has made an incalculable contribution in building the AHS collections. She secured numerous donations and has always been active in identifying and liaising with donors, resulting in a richer set of collections and helpful future contacts for the Society. She also organized the transfer of relevant items between the AHS and other local Historical Societies. Pat’s outreach has been unparalleled. She engages the support and interest of professionals and local volunteers. She has a knack for identifying the natural interests and potential of volunteers, inspiring people to take on new roles, and empowering them to work independently. This base of local support allows the AHS to open its museums every weekend throughout the summer, and to stage one of Andover’s two major community events. The practices and relationships that Pat has brought to the AHS over a quarter century will ensure the preservation and local appreciation of Andover’s history for decades to come.